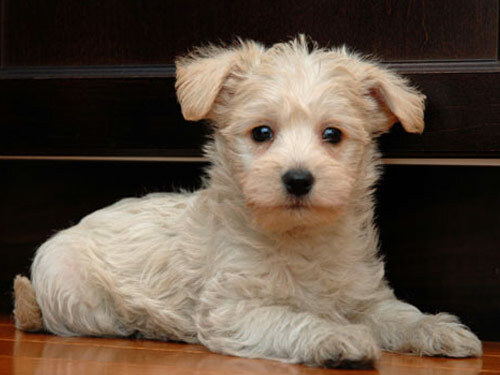 The Westiepoo is created by the crossing of two breeds: West Highland White Terrier and Poodle. They are commonly referred to as a "designer dog" and have become popular as companions due to their hypoallergenic coats. Hardy and well-balanced, the Westiepoo is of medium size. They possess an appealing expression, are compact, agile, and sturdy in appearance. The Westiepoo is spunky, lively, and clever. They are affectionate, loving, and family oriented. They do not do well if left alone for extended periods of time. If they become lonely or bored they will become destructive and bark incessantly. Westiepoo's do best in a home with older, considerate children. They generally do well with dogs or other household pets they have been raised with. They are typically non-aggressive but may be snappish when irritated. The Westiepoo makes a good watchdog as they will bark to alert their family to visitors or out of the ordinary sounds. Regular brushing is recommended for the Westiepoo. Bathing should only be done when necessary using a mild shampoo. They may be prone to such health issues as liver disease, chronic skin problems, PRA, and epilepsy. The coat of the Westiepoo is wavy, light-weight, and soft. Early socialization and obedience is recommended. The Westiepoo may be difficult to housetrain. The crate training method works best. They will not respond to harsh or heavy-handed methods. Training must be done with firmness, fairness, patience, and consistency. The Westiepoo is well-suited for apartment living provided they are sufficiently exercised. They enjoy securely leashed walks, family activities, and off-lead play in a securely fenced yard.